For 2015, Volkswagen brings fresh aesthetics and additional features to its premium SUV, the Touareg. This second-generation vehicle enters the new model year with an updated look to complement its powerful and efficient line of engines and world-class engineering. With new cutting-edge available driver assistance and convenience systems now on board, the 2015 Touareg will be available in dealer showrooms in early 2015. The 2015 Touareg is differentiated from its predecessor by an aggressive-yet-elegant refreshed exterior. Sporting a crisp, sleek and aerodynamic look that is firmly set in Volkswagen DNA, it has an instantly recognizable family theme. Overall dimensions stay the same at 188.8 inches in length, 76.4 inches wide and 68.2 inches high (68.4 for the Hybrid). Key design elements include an all-new 4-bar chrome grille that connects seamlessly to the redesigned headlights, which themselves sit flush with the grille’s base. Standard on all models, these headlight clusters feature Bi-Xenon high intensity gas-discharge headlights, the Adaptive Front-lighting System, and an updated LED Daytime Running Light design. The new horizontal theme continues throughout the Touareg’s redesigned front end. A new lower valance incorporates redesigned foglights, and an updated bumper is easily distinguishable by the “A” shape of the connecting pillars, which now lean inward rather than outward. Moving to the back, LED taillights are now standard on all 2015 Touareg models. These units flank a modified tailgate design with an elegantly sharpened “Tornado Line” running across the entire width. The rear bumper features chrome accents that now wrap around the Touareg entirely; the lower spoiler features blacked-out trim. Signature triangular exhaust tips round out the overall look. The 2015 Touareg brings a completely new selection of wheel choices, depending on trim. The 18-inch Arica design offers a sharply chiseled 10-spoke design, while the 19-inch Salvador and 20-inch Montauk both feature variants of a doubled five-spoke look. Several new paint colors are offered for the 2015 Touareg: Black Oak Brown Metallic, Sand Gold Metallic, Reflex Silver Metallic, Moonlight Blue Pearl, and Deep Black Pearl. In addition to the exterior redesign, the 2015 Touareg offers a significantly refined interior. Building on an existing modern and luxurious layout, the cabin of the latest Touareg takes the premium character even further. The cabin is illuminated with white LED overhead lighting, and new chrome trim and wood accents lend a clean, luxurious feel throughout. The headliner color, dash frame, buttons and switchgear have all been updated as well. Two new interior décor themes—Sapelli Mahogany and Engineered Ebony—are now available. Mounted in the center of the dash is either Volkswagen’s RCD 550 sound system or the available premium RNS 850 navigation system, depending on vehicle trim. The RNS 850 features an 8-inch touchscreen capable of displaying maps and directions in high-definition 3D graphics, and a DVD/CD player with MP3 playback and satellite/AM/FM radio. Music can be stored on the 60GB hard drive (with 18GB reserved for uploaded media); iPod® device, auxiliary input, SD card and DVD drive interfaces can be found in the glovebox. Touareg Executive models come with a 620-watt Dynaudio® sound system with 10 premium speakers (four tweeters, two midrange, and four woofers) and Digital Signal Processing (DSP) technology. Another feature on the Executive trim is the Area View 360° exterior camera system. Utilizing four cameras (in the rear hatch, the door mirrors and the radiator grille), Area View transmits images of the complete area around the Touareg onto the touchscreen in the center console. The control unit also calculates from the four individual camera images a high-quality overall view of the surrounding area—from the perspective of a virtual camera above the vehicle. On off-road terrain, Area View relays via the front and side cameras the scene immediately ahead and to the side of the vehicle. The second-generation Touareg brought a substantially increased 113.9-inch wheelbase, which allows for 36.9 inches of rear legroom, as well as a 40/20/40-split rear seat with 6.3-inches of fore/aft travel and reclining backrests. The Touareg can also accommodate 32 cubic feet of cargo and luggage behind the rear seats, or 64 cubic feet with the split rear seat folded. On Sport with Technology and higher trim levels, the hands-free Easy Open liftgate allows for convenient access to the back of the vehicle. 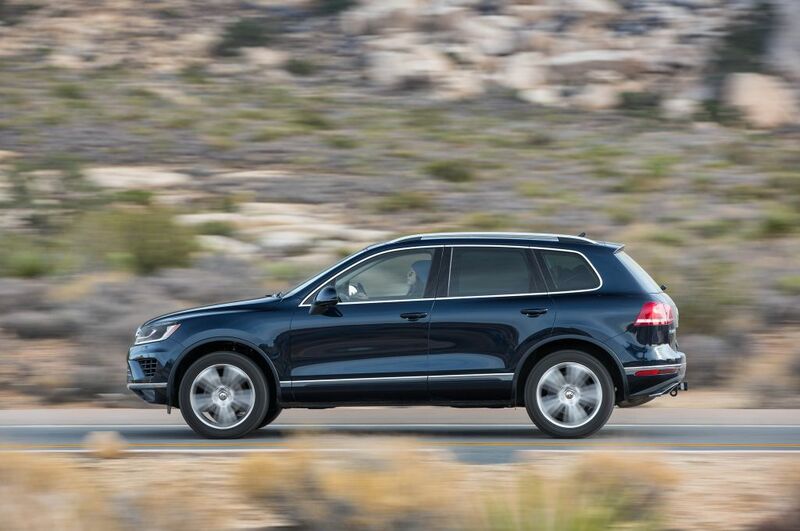 The 2015 Volkswagen Touareg is available with three powerplants: V6 FSI® gasoline, V6 TDI® Clean Diesel, and Hybrid. All three engines are mated to an eight-speed automatic transmission with Tiptonic® shifting capability. A 4MOTION® all-wheel-drive system is also standard. All Touareg models are capable of towing 7,716 pounds. As one of Volkswagen’s most powerful naturally-aspirated engines, the gasoline-powered 3.6-liter V6 delivers 280 horsepower at 6,200 rpm and 266 pound-feet of torque at a low 2,500 rpm. As in all current Touareg engines, the engine utilizes a crossflow aluminum-alloy cylinder head design, twin overhead camshafts, four valves per cylinder, variable valve timing and direct fuel injection. The Touareg V6 has an EPA-estimated fuel economy of 17 mpg city and 23 mpg highway. Diesel models are powered by a 3.0-liter, turbocharged V6 and direct-injection TDI® engine built around a compacted graphite iron (CGI) block. By using this material, Volkswagen engineers were able to reduce engine weight by 55 lb over the previous cast-iron unit without any loss in structural integrity. This engine produces 240 hp at 3,400 rpm and an impressive 406 lb-ft of torque at just 2,000 rpm. The EPA-estimated fuel economy for the TDI model is 20 mpg city and 29 mpg highway, giving the TDI a remarkable range of up to 765 highway miles from the large 26.4-gallon fuel tank. To achieve its 50-state emissions qualification, the 2015 Touareg is equipped with a deNOx catalytic converter augmented by a special injection system that sprays AdBlue® into the exhaust, helping to reduce NOx emissions. Thanks to this, the TDI meets ULEV/Tier 2, BIN 5 standards imposed across all 50 states. All Touareg models send power to the 4MOTION permanent all-wheel-drive system via an eight-speed automatic transmission that features manual gear control, Sport mode and Dynamic Shift Program (DSP) technology that adapts to the driver’s individual style by adjusting the shift points accordingly. This transmission also uses its seventh and eighth ratios as overdrive gears, with the top gear reducing engine rpm by about 30 percent compared to sixth. Because of this, the vehicle’s top speed is actually achieved in sixth gear. In addition to the fuel economy benefits of the low overdrive rpm, this configuration allows for substantially quieter, more relaxed highway cruising. Finally, the 2015 Touareg Hybrid, available at participating dealerships, rounds out the lineup with its state-of-the-industry combination of gasoline engine and electric motor. This unit pairs a 3.0-liter, 333-hp supercharged V6 engine to a 47-hp electric motor, delivering a total system output of 380 hp and 428 lb-ft of torque when running simultaneously. Both systems are capable of operating independently of one another as well. The electric motor gets its energy from the nickel metal-hydride battery pack that lies beneath the Touareg’s luggage compartment, a 288-volt unit consisting of 240 individual cells and offering an energy density of 1.7kWh. The Touareg Hybrid can also cruise at speeds up to 31 mph on pure electric power alone. The powerful Touareg Hybrid uses an assortment of innovative technologies to achieve an EPA-estimated fuel economy of 20 mpg city and 24 mpg highway. One such technology activates when the driver releases the throttle pedal at cruising speeds—the engine shuts off and a special clutch disengages the transmission, allowing the car to coast practically emissions-free. This is similar to the Hybrid’s standard Stop-Start system, which automatically stops the engine during idle while the brake pedal is held (such as when waiting at a red light). When the brake pedal is released, the engine restarts seamlessly. Additionally, the Touareg’s braking system utilizes regenerative braking to allow the electric motor to recover kinetic energy during coasting and braking. The 2015 Touareg features the latest iteration of the independent suspension layout that debuted with the second-generation SUV. With lightweight aluminum-alloy upper and robust steel lower control arms at both front and rear, the Touareg’s coil-spring suspension is capable of great control and road manners in any situation. The 4MOTION permanent all-wheel-drive system is standard on all Touareg models. This features a Torsen® limited-slip differential that splits available torque 40 percent front and 60 percent rear (nominally) for balanced driving both on and off road. The Touareg V6 and TDI models feature a variable-ratio hydraulic power-assisted steering system that needs just 2.6 turns from lock to lock. This gives a precise, responsive feel in various conditions, from parking lots to the open highway. The Touareg Hybrid uses electric power assistance for its rack-and-pinion steering system. The Touareg V6 and TDI models are fitted with 13.0-inch vented disc brakes front and rear, while the Hybrid is equipped with larger 14.2-inch rotors at the front. A combination of both passive and active safety systems helps to keep occupants protected in the latest Touareg. In addition to the chassis, which was designed from the ground up with strength and stability in mind, the Touareg also has a total of six airbags—including Side Curtain Protection® head airbags for front and rear outboard occupants, and front and thorax units for driver and front passenger—and a number of mechanical and electronic systems that work in tandem to help keep the Touareg stable. All Touareg models have the Automatic Post-Collision Braking system as standard. This builds on the premise that a collision is rarely a single, instantaneous action, but rather a series of events that follow the initial impact—the most significant of which can cause additional collisions. The Automatic Post-Collision Braking system helps address this by applying the brakes when a primary collision is detected by the airbag sensors, thus helping reduce residual kinetic energy and, in turn, the chance of additional damage. This lineup of active safety systems also includes an advanced Rollover Sensor System that monitors the vehicle’s turning angle and speed in order to detect any possible rollover situations. If it determines a rollover hazard is present, it deploys the Side Curtain Protection airbags to help reduce any risk of injury. Anti-lock brakes and a stability control system are standard on all models. The 2015 Touareg is now available with a number of advanced driver assistance features, depending on trim line. Among the available driver assistance features, Adaptive Cruise Control (ACC) uses dual front radar sensors to maintain a set following distance to the vehicle in front of the Touareg. This system can bring the Touareg to a complete stop in traffic situations. This double radar system has a range of just over 200 yards with a field of view of 40 degrees. Together with ACC, Front Assist with Autonomous Emergency Braking provides forward collision warning and emergency braking functionality. When the system detects an imminent collision, visual and audio signals alert the driver and, if necessary, autonomous emergency braking is activated to slow the vehicle. The Lane Assist lane departure warning system is camera-based. If there is a danger of the car changing lanes without the turn signal being engaged, the system helps alert the driver by vibrating the steering wheel and by depicting the lane markings that the car has crossed on the multifunction display in the instrument panel. The system consists of a camera between the headliner and the rear-view mirror and a motor that vibrates inside the steering wheel. The camera recognizes visible lane markings (one side suffices) and, using a special algorithm and taking into account vehicle information, calculates the risk of the car leaving the lane. Lane Assist is activated at speeds of 40 mph and above. The final new available driver assistance feature on the 2015 Touareg is Side Assist. Two radar sensors at the rear on the Touareg scan the approaching traffic. LEDs in the side mirrors help inform the driver of a vehicle in the blind spot or approaching at a higher rate of speed. Any use of the turn signal during this phase shows that the driver intends to change lane and thus signals potential danger. The LEDs in the side mirrors now flash brightly, warning the driver of a situation that could possibly be dangerous. The 2015 Touareg models are offered with a 10-year/100,000-mile (whichever occurs first) powertrain limited warranty and 3-year/36,000-mile (whichever occurs first) new vehicle limited warranty. In addition, a 3-year/36,000-mile (whichever occurs first) roadside assistance program is standard, as is the 1-year/10,000-mile (whichever occurs first) Carefree Maintenance® Program that covers scheduled maintenance during this period, at no additional charge. The 2015 Touareg line-up offers customers a choice of four trim levels: Sport, Sport w/Technology, Lux and Executive. The Touareg Hybrid is a stand-alone model. Starting at $44,705, the Sport, available only in V6 form, comes very well-equipped, including 4MOTION all-wheel-drive, an eight-speed automatic transmission, 18-inch Arica aluminum-alloy wheels, Bi-Xenon headlights with the Adaptive Front-lighting System, the premium RCD 550 touchscreen radio, V-Tex seating surfaces, power driver and passenger seats with driver memory function, MDI (Media Device Interface) with iPod cable, unique chrome trim, LED taillights, and the Automatic Post-Collision Braking System. Building on the Sport model, the Technology trim—the base TDI Clean Diesel model—adds navigation, the Easy Open liftgate, Keyless access with push-button start, Side Assist, and a towing package. This model starts at $48,745 for the V6 and $52,245 for the TDI Clean Diesel model. The midrange Touareg starts at $53,170 for the V6 and $56,670 for the TDI model. It includes all of the features of the Sport w/ Technology models and adds 19-inch Salvador wheels, an all-new wood trim interior, 12-way power leather seating surfaces, a panoramic sunroof and Park Distance Control. An available Driver Assistance Package includes Front Assist and Lane Assist. Priced from $58,700 for the V6 and $62,200 for the TDI model, the Touareg Executive tops the lineup. The following features are added to the Lux model: 20-inch Montauk wheels, stainless-steel pedals and scuff plates, a unique wood trim, heatable steering wheel and rear seats, 10-speaker Dynaudio audio system, the Area View exterior camera system and rear sunshades. The Driver Assistance Package is also available. The Touareg Hybrid is the flagship model and starts at $66,995. This includes the powertrain that combines the supercharged V6 engine and electric motor for a total of 380 horsepower. With a feature list similar to the Executive models, it adds unique Girona 19-inch aluminum-alloy wheels, and the contents of the Driver Assistance Package as standard features.